“I think we got, like, sucked into the game. I was sure about one thing. A remake of “Jumanji” is the same as repainting the Mona Lisa and exhibiting this copy. Ridiculous, inglorious and unnecessary. I was afraid this movie would be ridiculed and laughed with. And on top of that, they’ve asked Dwayne Johnson to join. Not exactly an actor you’ll see in what they call the “better” films. I thought it would be something like “Journey 2: The Mysterious Island” and that I would curse the makers afterward, because they dared to copy a milestone with the late Robin Williams starring in it. For once, however, I have to admit that I was wrong. It’s been a long time since I’ve amused myself so much while watching a movie. Never thought I would say this. Dwayne Johnson is hilarious. In the original movie, it was, of course, Robin Williams who took care of the humorous part. And also the inhabitants of the jungle (with some bad looking computer graphics) who stirred things up in town, were kind of fun. In this movie, nobody really stands out. They are all hilarious. And this because of the fact that the four main characters (who are being sucked into the game) are totally the opposite of the in-game character they’ve chosen. During a detention, these four totally different students discover this dust-covered Jumanji game. This well-known game has been transformed into an oldskool console game (well, they had to keep up with the times). Spencer (Alex Wolff) is a spindly little boy, plagued by all kinds of allergies, who looks rather clumsy and timid. Fridge (Ser’Darius Blain) is an immense athlete. Bethany (Madison Iseman) is such a typical blond teen girl who thinks she’s the center of the universe instead of the sun. Martha (Morgan Turner) is the shy type. Again the same stereotypes you’ll see in a film about an American high-school. It’s plain fun watching this. It becomes really funny after they have been transformed into the characters from the computer game. Maybe too predictable but still hilarious at times. The schmuck suddenly sees how his biceps have grown. The stuck-up, smartphone-addicted Instagram bimbo notices to her horror that her perfectly streamlined teenage body is trapped in a chubby, male body. The timid girl is suddenly a duplicate of Lara Croft and to her surprise, she has knowledge of certain combat techniques. The well-built sports fanatic gets a rather submissive role as a dwarfish male with a backpack. Now get ready for the big surprise. The most hilarious role is played by Dwayne Johnson. That was really the last thing I expected. And of course Jack Black provides some humorous moments. Although the male genitalia is the main subject here. And the part where Karen Gillian has to learn the art of seduction, I actually was laughing my head off. And finally, a small remark. The pilot in the game (who’s the long-lost teenager) looks a lot like football star Eden Hazard! From now on, I won’t make any assumptions anymore. But not only the interplay and the witty interactions convinced me. I also thought that the cleverly put together concept of a video game was a brilliant idea. The NPC’s that showed up here and there, the cutscenes and the way the participants return to the game (after which the tattoo on their arm suddenly changes) are all elements you can experience in a game. In other words, this film scores extremely high in terms of originality. 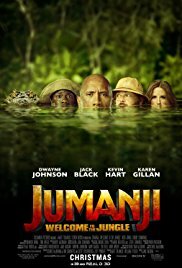 On the one hand, the film “Jumanji: Welcome to the jungle” is an extension of the original film. But on the other hand, it’s also a stand-alone film (with only one reference to the original flick). So I have to admit that I am pleasantly surprised by this film. And even with Dwayne Johnson in the lead. There are no more certainties in this life!